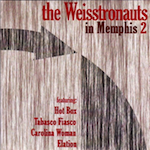 More tracks continue the country sojourn in this second volume of Memphis oriented tracks. Quite nice. "Hot Box" is a light hearted country instro with a cycling riff and an easy sound. Nicely played and captured well, but until the break, it's pretty repetitive. The break moves into a thicker rock sound with feedback and jammin' riffs. Bouncing twango with fun riff. Tremolo second guitar and a nicely written break, which is where the variations occur. Light and playful, with a bouncing rhythm and hoe down feel. "Carolina Woman" has a classic fifties country sense about it. Simply fun! Fading in gradually, "Elation" moves a bit away from the country and into urban thinking. Layered guitars and textures, wah-wah, and some very tasty scale progressions.